Letters will be going to primary and first schools in West Somerset and Taunton Deane shortly to offer places to groups of children on trains on Tuesday 5th September. Children will ride on the first of the Flying Scotsman trains on a 40 mile round trip, one way behind Flying Scotsman and one way behind another named visiting locomotive. Each school will simply have to pay a £50 administration charge, and all tickets will be free. The schools invitations are to give schools a chance to incorporate the visit in the curriculum. The visit is for children studying at Key Stage 2 (aged 7 to 11) to use the visit for history, geography or other work in the National Curriculum. It is for each school to decide exactly how it wants to use the visit. The West Somerset Railway itself is a historic resource, dating from 1874, but the presence of the Flying Scotsman locomotive adds a rather different historic dimension having been mainly used on the London to Edinburgh run from the 1920s to the end of steam. It was the first locomotive to officially break through the 100 miles per hour barrier, and it is now owned by the National Railway Museum, based in York. The name Flying Scotsman sometimes causes confusion, because it was first applied to an express train from London Kings Cross to Edinburgh Waverley. In later years it ran non-stop, and was the longest non-stop train run in Britain. Sometime after the train started running the name was applied to the new express locomotive built in 1923, which became British Railways no 60103. This is the 94 year old locomotive that is coming to Somerset at the end of the summer. The Flying Scotsman will be in Somerset hauling trains from Tuesday 5th September until Tuesday 12th September. Each day it will take two special nonstop passenger trains from Bishops Lydeard to Minehead and back – one in the morning and one in the afternoon. All tickets have to be booked in advance, and there will be limited numbers available. 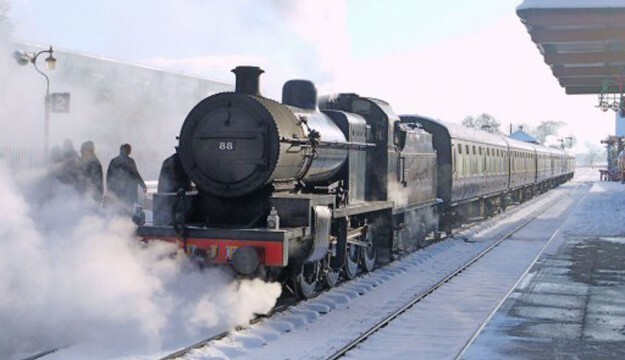 Passengers can book for all the trains – apart from the first two school trains – on the West Somerset Railway website, starting on Monday 3rd April. On four evenings there will also be evening dining trains, details of which will be announced later. Wherever else in the country Flying Scotsman has gone it has attracted passengers in full trains and crowds of onlookers. This is its first visit to the West Country for over twenty years, and the first ever to the West Somerset Railway. The Railway expects to have over 5000 passengers riding behind the locomotive in the days it is running. There will also be a full service of stopping trains, for people to ride to view the locomotive passing through. To ensure that local businesses can make the most of this event, the West Somerset Railway will be convening two evening meetings, at each end of the railway, so that local businesses in particular can learn about the event and how they might be able to build on the numbers of additional visitors to West Somerset. The dates and locations of these meetings will be announced shortly in the local press.